Making the most of the autumn heatwave where it felt like summer just a few weeks ago and wearing some more tanks and soft shorts outfits. I picked these green tanks to wear after seeing a post on Jodie's blog about wearing different shades of green, and realised these tanks were overdue a wear. 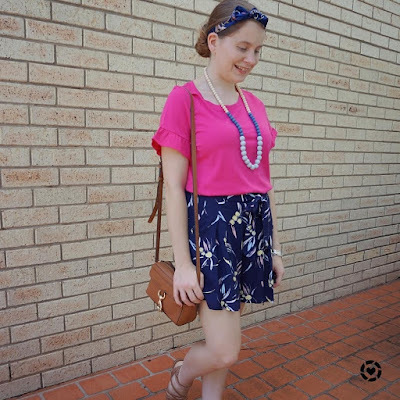 I had thought about wearing a kimono with this outfit, but when it was 39 degrees (102 Fahrenheit) I decided to keep it simple with just the tank and soft shorts. Spent one of my usual days with the boys, attending the playground and library in the morning and trying to fit in a few errands too. We didn't spend long at the playground though due to the heat! This olive embroidered tank was a complete impulse buy from the Target sale rack a couple of years ago and every time I wear it I'm grateful to my past self for picking it up! It worked perfectly for breastfeeding, the long loose style letting me pull it up on one side while still keeping my belly covered. And on a hot day the loose flowing fabric was perfectly cool. 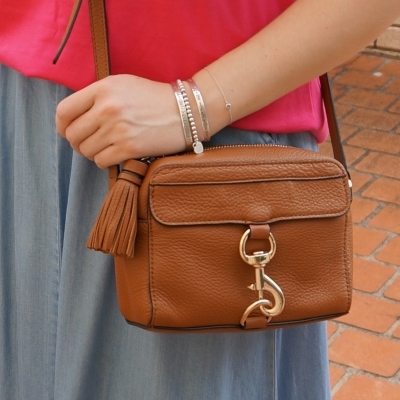 Paired with some light shorts and then the rose gold sandals to match the gold hardware on the Rebecca Minkoff MAB camera bag, perfect outfit. 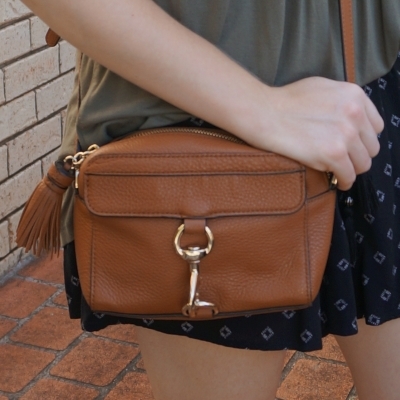 Last worn: olive embroidered tank, black printed shorts, rose gold sandals, Rebecca Minkoff MAB camera bag. Other ways to wear: olive embroidered tank for travel, black printed shorts in monochrome outfit, rose gold sandals and maxi skirt, Rebecca Minkoff MAB camera bag and maxi skirt. This was the outfit that came to mind when talking with Jodie in the comments of her blog post, about trying two green pieces together. 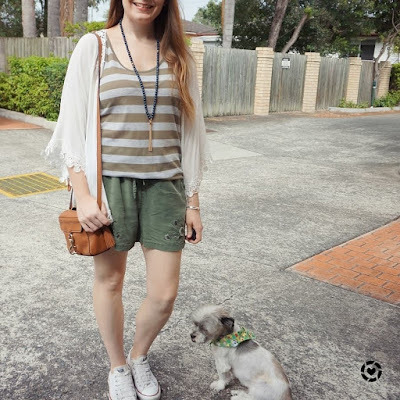 I thought this striped tank would be a nice match with the olive embroidered shorts. I was surprised when I put the two together and realised the tank wasn't as olive as I'd thought, more of a khaki! I decided to try it anyway, but at the last minute added a bit of brightness to all the neutrals with the plain white kimono. I have a lot of kimonos in my collection, and this plain white one comes in helpful when I can't decide what printed one to wear, as it goes with everything! It came in helpful at the playground too for a bit of a blocker against the mozzies, they have been particularly bad in the Bayside lately! 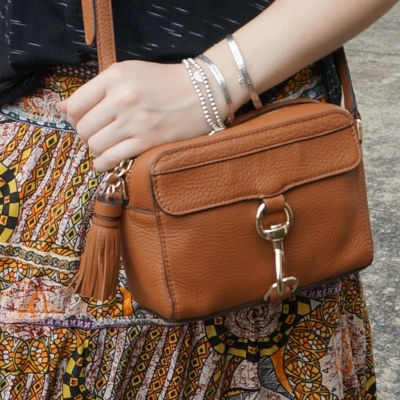 Again I stuck with the Rebecca Minkoff MAB camera bag, the tan is a nice neutral with the olive tones. Picked closed in shoes as it was a little cooler, and Converse are so comfortable for running around the playground with the boys. Last worn: white crochet kimono, navy and gold tassel necklace, green and grey striped tank, olive embroidered shorts, Converse, Rebecca Minkoff MAB camera bag (above). Other ways to wear: white crochet kimono and printed shorts, green and grey striped tank and skinny jeans, olive embroidered shorts and printed scarf, Converse and printed dress, Rebecca Minkoff MAB camera bag and maxi skirt. Perfect for pregnancy: green and grey striped tank in second trimester, Converse in second trimester. I find green a tricky colour to wear, but olive is a nice neutral! You can play it safe like I have in the first outfit by wearing it with other neutrals, black and tan and gold all work nicely. 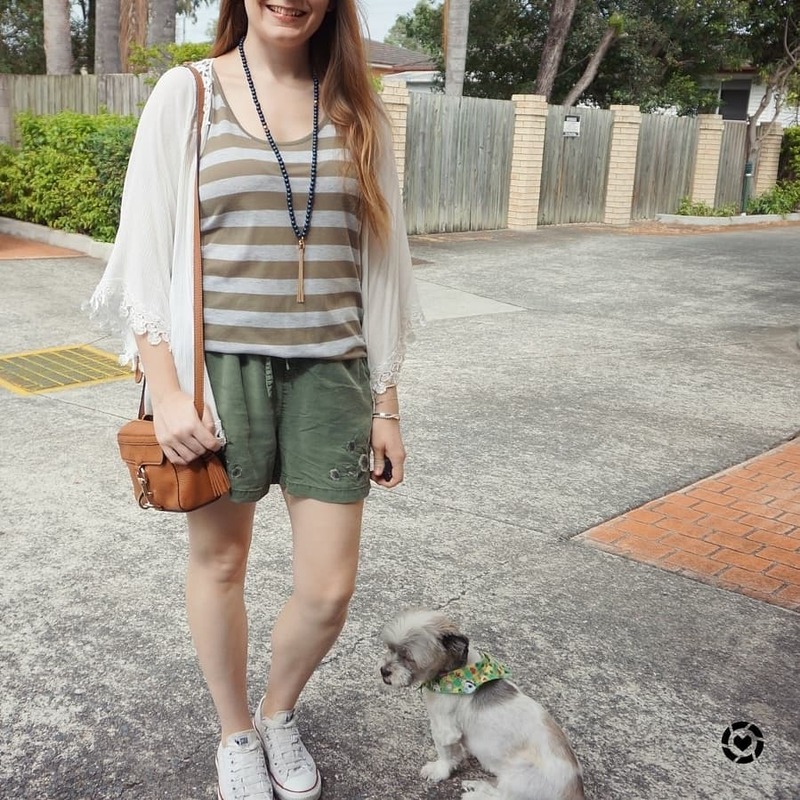 If you're feeling more adventurous, you can branch out a little more and try two green pieces together like I have in the second outfit with the olive embroidered shorts, for something a little different. Linking up with Fancy Friday. This little tan Rebecca Minkoff MAB camera bag was a Christmas gift and I'm thrilled with how well it works in my wardrobe. 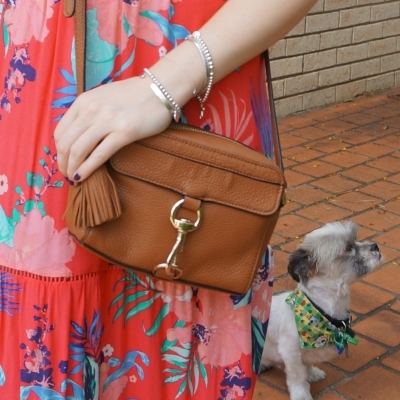 It's the perfect neutral cross body bag to wear with a lot of colour and print, as I'm wearing it here with two printed maxi dresses. Cooper posing in these pics makes me giggle! I actually wore this quite a few weeks ago, back in February! Decided to wear this pretty maxi dress for a day out shopping with my sister and the boys. My sister had a lot of gift cards to spend after Christmas, as did I, so we spent some time checking out a few different stores. As much as you can with two little boys under 5! I'd taken them to the playground before to tire them out a bit, but it was still a tricky endeavour managing to shop. I did do a little shopping though, and picked up this tee at Jeanswest. Jeanswest was one of our last stops as the boys were ready for a nap! Luckily the staff found their overtired antics amusing, and gave them some stickers which they were thrilled with. Was a really fun day. Not the first time I've worn this maxi dress with a tassel necklace, I really love the look! I thing the blush one worked so nicely with it. While the Rebecca Minkoff camera bag doesn't match the sandals exactly, they are similar enough that I liked the combination. 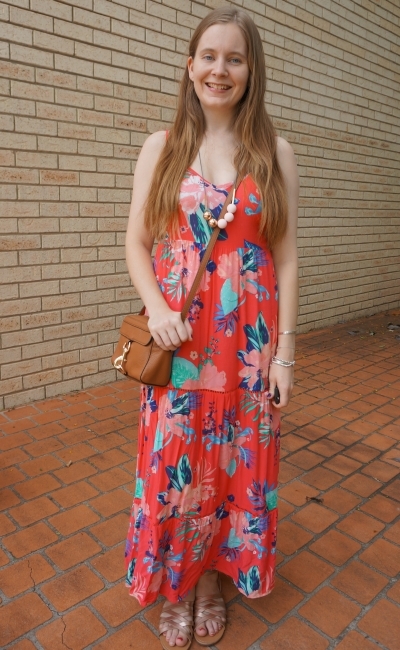 Last worn: printed maxi dress, blush tassel necklace, studded sandals, Rebecca Minkoff MAB camera bag. Other ways to wear: printed maxi dress on Christmas day, studded sandals and shorts, Rebecca Minkoff MAB camera bag and maxi skirt. Perfect for pregnancy: studded sandals in third trimester. Again an outfit from a while ago. It was a little windy on the day I wore this, my dress seems to be hiding Cooper! With the possibility of Cyclone Oma hitting on the weekend, I took the boys out for a morning in the playground to burn off some energy. Just a simple dress as it was a hot day despite the breeze. After some time at the playground we headed to the shops to stock up on some snacks, just in case we were stuck inside all weekend. Luckily the cyclone blew back out to sea quite quickly and there were no major impacts. 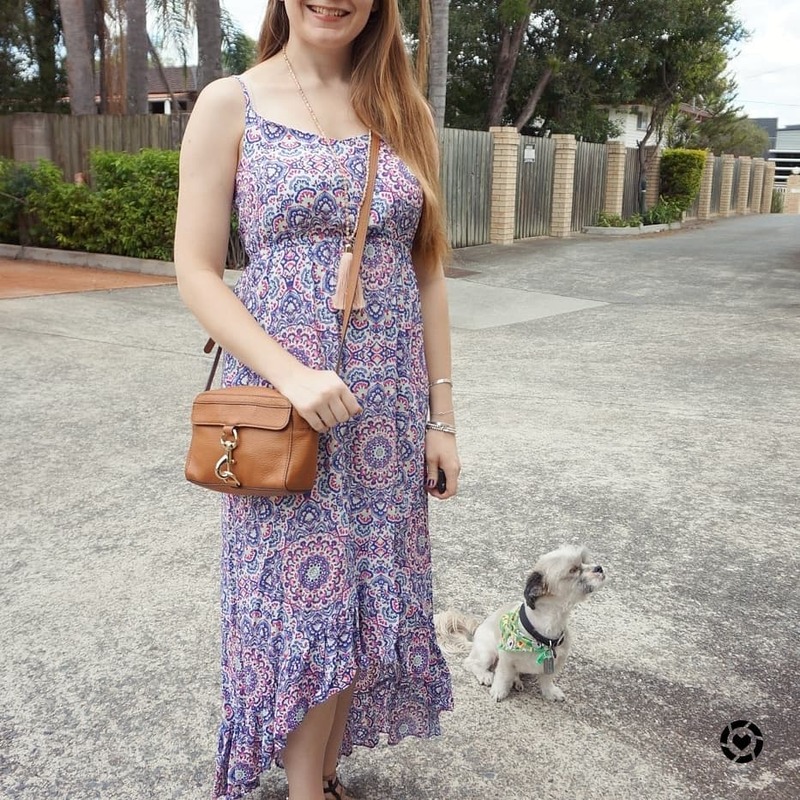 Again I paired this neutral cross body MAB camera bag with the colourful printed maxi dress, it's a good combination even if this dress has a different mix of colour and print than the one above. Last worn: tropical print tiered maxi dress, gold and blush beaded necklace, gold sandals, Rebecca Minkoff MAB camera bag (above). Other ways to wear: tropical print tiered maxi dress under a tee, gold sandals and tee dress, Rebecca Minkoff MAB camera bag and printed shorts. 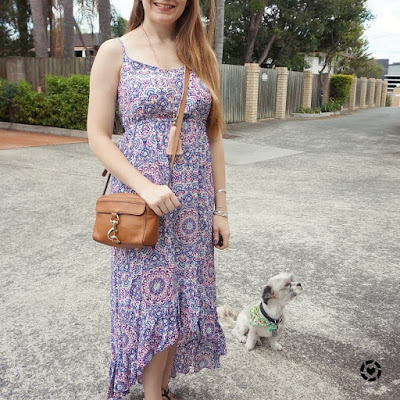 The first printed maxi dress that I'm wearing above is actually on sale for $41 at the moment, the price is wrong here. 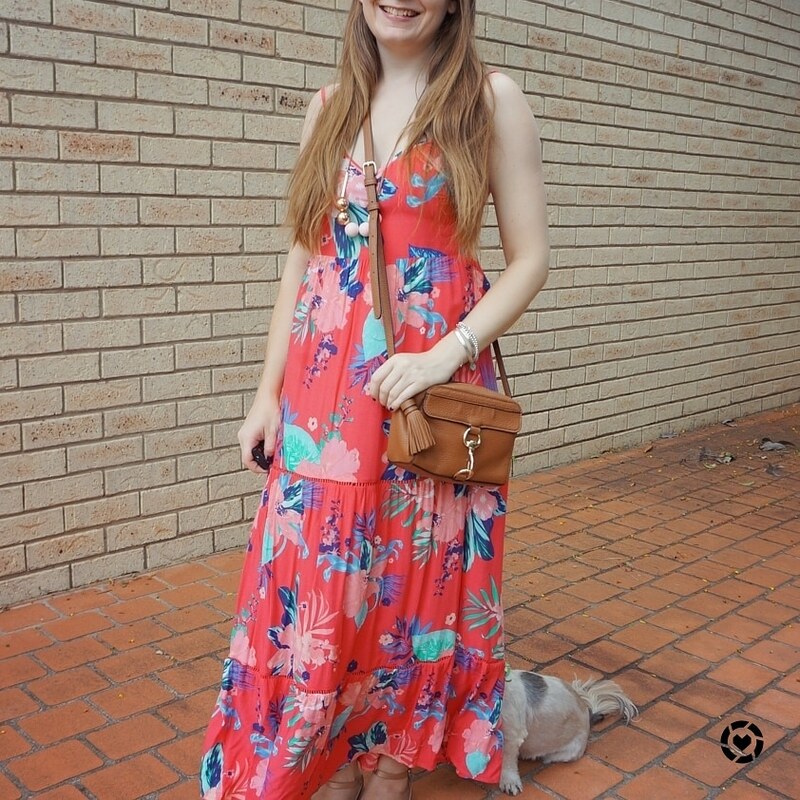 A fun, colourful printed maxi dress is so easy to wear when you pick neutral accessories to wear with it. 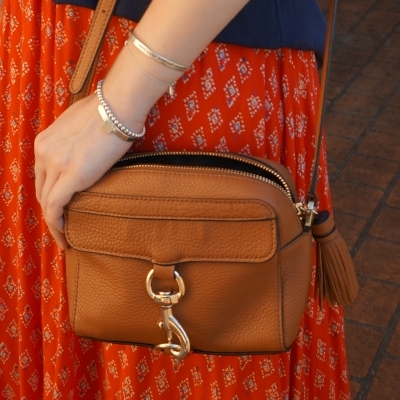 A tan cross body bag like this MAB camera bag works well with any colour or print. Linking up with Shoe & Tell, Modest Monday. This skirt is recently purchased - both it and the tee were only $1 each. While I do already have a black drawstring waist maxi skirt, it doesn't have the ruffled hem and does have splits up each side which limits when I can wear it. I can see this working for cooler weather with some ankle boots, and being petite I wasn't going to turn down a perfect length maxi skirt for just $1. I suspect it may have been altered before to suit its previous equally short owner! The perfect outfit for a busy day. 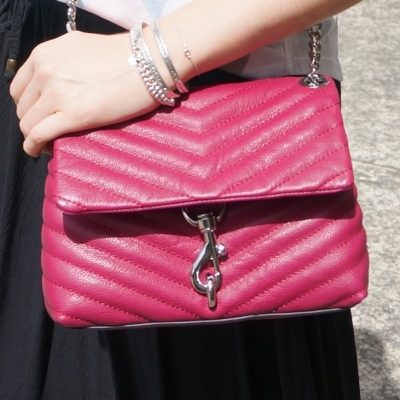 First wearing of my new Rebecca Minkoff Edie cross body bag too. I scored this in the January sales, and while it took a few weeks to arrive it was worth the wait! Wore this to a birthday party at McDonalds in the morning and then watching church online at my friends house in the evening. With the bold abstract print on the tee and the bright cross body bag, I didn't feel this outfit needed a necklace. Last worn: abstract print tee, Havaianas. 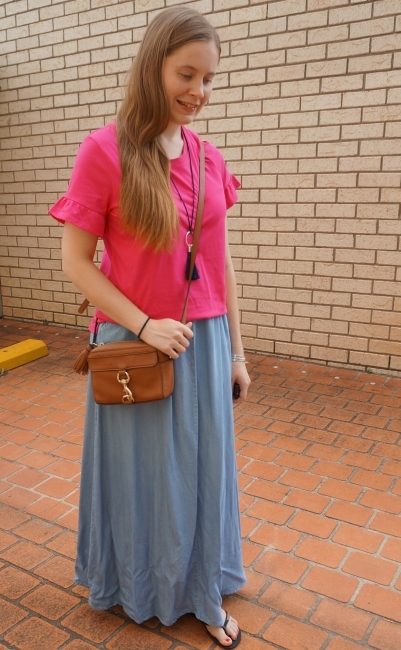 First time I've worn the ruffle maxi skirt and Edie bag too as they are recent purchases. Other ways to wear: abstract print tee and denim shorts. Another completely thrifted outfit if you exclude the accessories! This tee was even cheaper than the one above, working out to just 67 cents as I got it in a 'fill a bag for $2' sale with a few other pieces. This is its sixth wear too, getting great cost per wear. I've tried print mixing with it before, this time around I thought I'd pair it with this printed maxi skirt. Which I got in the same $2 bag of clothes. It was originally a dress, and I decided to have it altered into a skirt. It's such a fun summer piece. 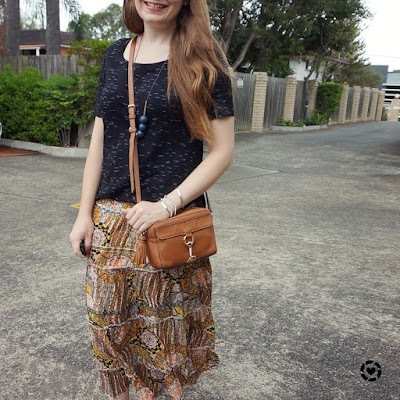 I liked the way that the space dye tee worked with the mixed prints on the skirt, and I think the Rebecca Minkoff MAB camera bag tied the two pieces together nicely. Since the bag was a Christmas gift, that leaves the sandals to be the most expensive part of my outfit and I purchased them for $20! Last worn: black printed tee, gold and navy beaded necklace, mixed print maxi skirt, gold sandals, Rebecca Minkoff MAB Camera Bag. Other ways to wear: black printed tee in the office, mixed print maxi skirt and denim jacket, gold sandals and shorts, Rebecca Minkoff MAB Camera Bag and frill sleeve tees. There is a false assumption that you need to wear a new outfit every day or you can't rewear things - in fashion in general, not just in blog land. I definitely challenge that and I enjoy showing you different ways to wear things in every post, and my 30 wears series to illustrate that you don't need new things all the time. And you certainly don't need to spend a lot when you do buy things! In blogging, there is pressure to wear new things, things you can link and generate commissions on sales of. And I truly do appreciate those of you who buy things through the affiliate links I share to give me a little extra money for my hobby. But I'd much rather be a useful blog, that gives you inspiration for ways to wear pieces you already have and encourages you to rewear pieces to get more value from the things you've bought. 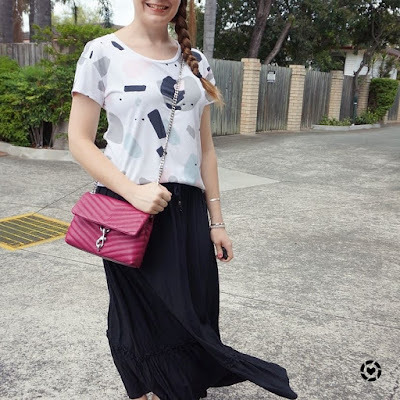 Linking up with Fashion Files, Thursday Moda, Jennifer's Link Up, Fancy Friday, Flashback Fashion, Lizzie In Lace, Sharing a Journey, Friday Faves. 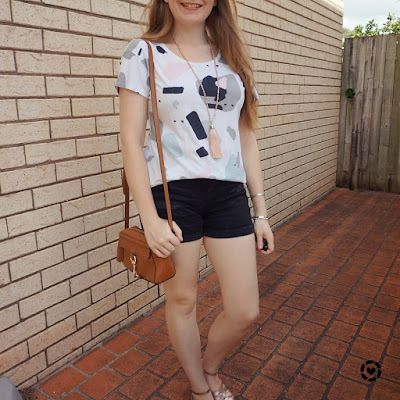 With the summer heatwave back in January, shorts and a tee were all I could face wearing! Of course I tried to make the outfits a little different by wearing printed tees and adding some accessories: long tassel necklaces and a neutral Rebecca Minkoff MAB camera bag. I was excited to get in my first wear of this new tee that I thrifted recently for just $1! I've been hunting for a good opshop after my local go-to closed down, and while this one is further away, $1 per item of clothing is my kind of opshop. This was a Kmart tee, fairly recent I think, maybe last spring, so it wouldn't have cost much more new. Ordinarily I'd worry that shorts and a tee were too casual for a specialist appointment (especially with this doctor, she is impeccably stylish!) but it was too hot to contemplate anything other than shorts and a tee. With the black blobs in the print I thought the black denim shorts were the obvious choice, with the tan Rebecca Minkoff MAB camera bag and gold sandals to accessorise with. As I had the gold hardware on the bag and gold shoes and the pink on the tee, this pink tassel necklace that has a few gold beads spaced through the chain was the ideal finishing touch. Was comfortable and cool in this all day - from the playground with the boys in the morning, the appointment, and then lunch and working with my mum on something in the afternoon. 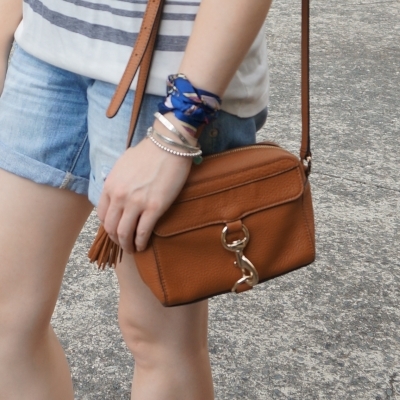 Last worn: pink tassel necklace, black denim shorts, rose gold sandals, Rebecca Minkoff MAB camera bag. First time I've worn the tee as it's a recent purchase. Other ways to wear: black denim shorts and red scarf, rose gold sandals and tee dress, Rebecca Minkoff MAB camera bag and plain tee. This day was a quieter day but again I stuck to the same outfit formula. They are the best. When you're not sure what to wear, think back to something you liked to wear and repeat it, changing a couple of things if you want the outfit to feel 'new'. I wanted something easy because as you can tell from my hair the heat and humidity was bad on this day! I picked a striped tee to wear this time, and as it had navy stripes decided on the blue denim distressed shorts to wear. I really liked the MAB camera bag and rose gold sandals together in the first outfit, so I repeated that outfit combo again, but I picked a turquoise tassel necklace to accessorise with this time instead of the pink one. For another point of difference, I added the Fashion Scarf Girl hair scarf on my wrist. I thought with the stripes on the top it might have been a little too much to wear in my hair, but it worked perfectly on my wrist. I've worn it on my wrist before. 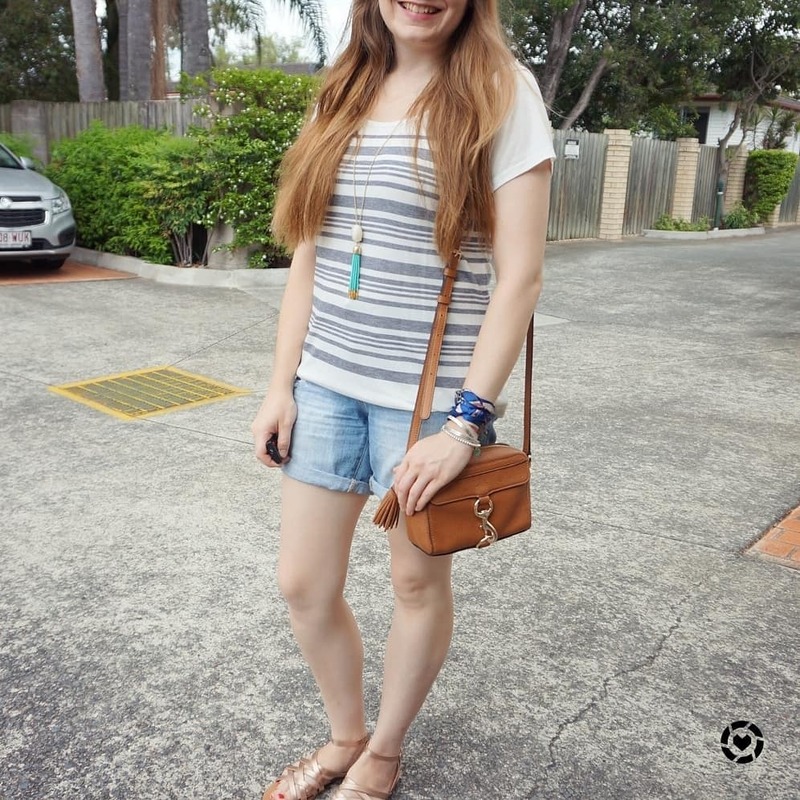 Simple shorts and striped tee summer outfit, for a morning out with the boys. A couple of errands, a trip to the library and playground and grabbing some groceries on the way home. Last worn: turquoise tassel necklace, striped tee, distressed denim shorts, hair scarf, rose gold sandals (above), Rebecca Minkoff MAB camera bag (above). Other ways to wear: striped tee with olive, distressed denim shorts and red scarf, hair scarf on bag, rose gold sandals and maxi skirt, Rebecca Minkoff MAB camera bag and printed shorts. Shorts and a tee is a summer staple - wherever you are in the world! A great fall-back outfit for a summer heatwave, it's easy to change things up slightly by wearing a fun printed tee instead of a plain one. If you're adding colour and print to your outfit with your top, you can stick with neutral accessories to compliment whatever print or colours you are wearing. Metallic sandals go with everything, and so does a neutral bag. Linking up with Friday Faves, Weekend Linkup, Shoe & Tell, Mutton Years Style. You will recognise these frill sleeve tees - I got them as presents last year from my mum. They are nice, basic block colours, with a fun little frill on each sleeve and heavy been frequently worn since I got them. While I've worn them with shorts before, it was time to try something different and pair them with maxi skirts. 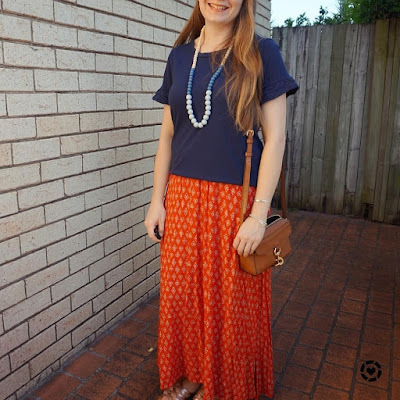 Not the first time I've worn this red printed maxi skirt with a navy top! I really like the combination. I thought this skirt would be perfect for another hot and humid day. I was just working from home so wanted something cool and comfortable to wear. This skirt is perfect as it's such a light fabric and it billows around as I walk, making its own lovely breeze! 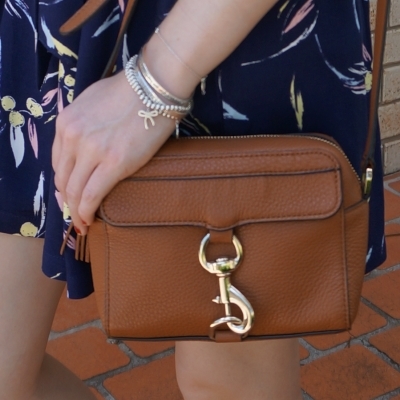 I kept the accessories simple - this beaded necklace pairs so nicely with the navy tee and I thought the gold sandals were a nice matchy-matchy touch with the gold hardware on the MAB camera bag, you know I love a bit of matching in my outfit. 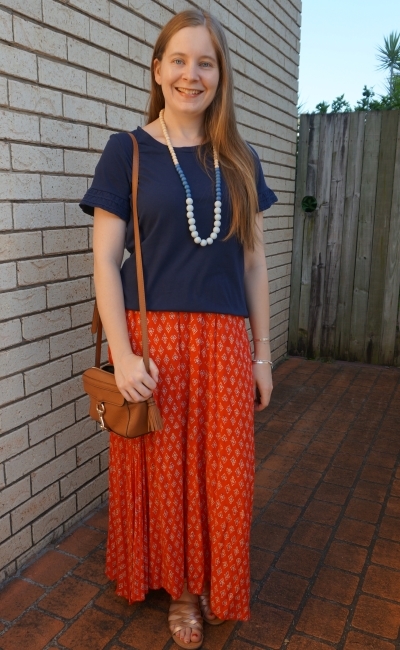 Last worn: navy frill sleeve tee, blue beaded necklace, red printed maxi skirt, rose gold sandals, Rebecca Minkoff MAB camera bag. Other ways to wear: navy frill sleeve tee and blush shorts, red printed maxi skirt with stripes, rose gold sandals and tee dress, Rebecca Minkoff MAB camera bag and printed shorts. Wanted an easy outfit for a busy day - had to go update my expired passport. I always look washed out in passport photos so I thought that the bright pink tee would be a good choice to try make me look a bit more awake! 😂 I also needed something simple to cope with the summer heatwave we were experiencing, so I could also run errands after the passport appointment, pickup my friend in the afternoon, and go to another friend's house to watch church online together. The night was a little more stressful than anticipated when my son, overexcited by dinner being ready, decided to bounce over to the unzipped opening of the mesh around the trampoline. I turned around after helping my other son down, just in time to see him bounce right out of the opening and off the trampoline through the air. I caught him before he hit the ground but he got a little bashed on the way down by the side of the trampoline. It was hilarious and terrifying all at once! 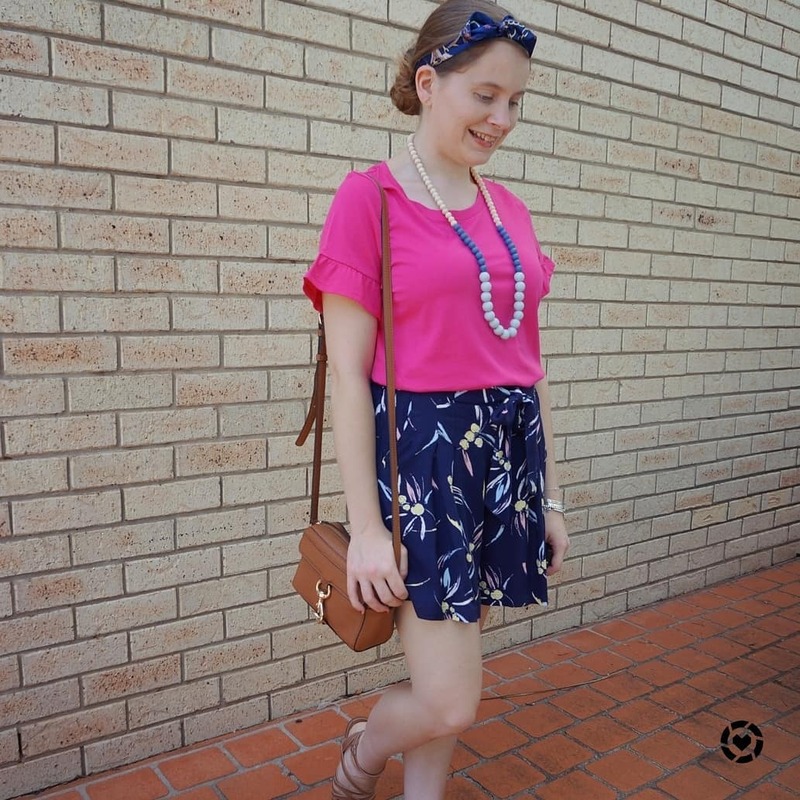 With the chambray skirt and pink tee, I thought this navy necklace complimented the combination nicely, even if the necklace had silver hardware and the MAB camera bag has gold hardware. I don't mind mixing metals in my outfits, and do it often. The camera bag was a great neutral addition for the colourful outfit. 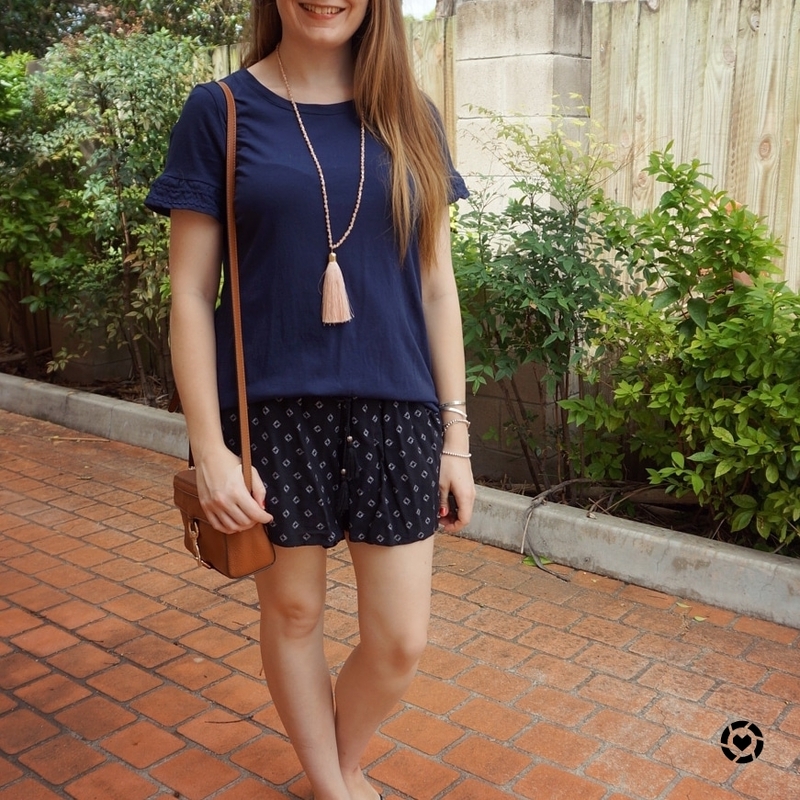 While I did love this outfit, the heat and humidity left my outfit looking a bit crumpled! One of those outfits that didn't look as good in the photos as I felt it did while wearing it. 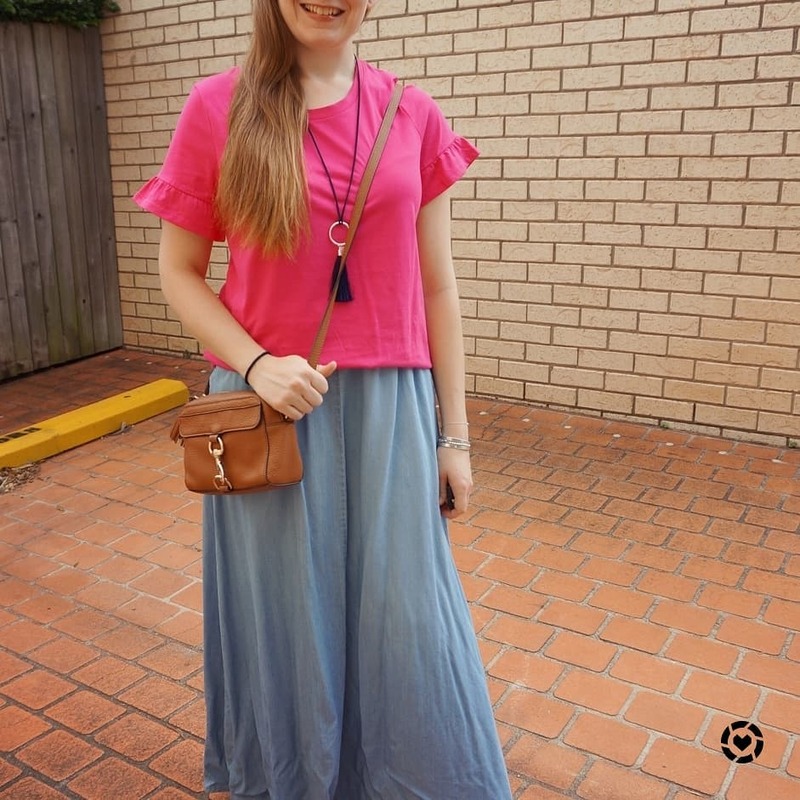 Last worn: pink frill sleeve tee, navy tassel necklace, chambray maxi skirt, Havaianas, Rebecca Minkoff MAB camera bag (above). Other ways to wear: pink frill sleeve tee and printed shorts, chambray maxi skirt and printed tank, Rebecca Minkoff MAB camera bag and shorts. 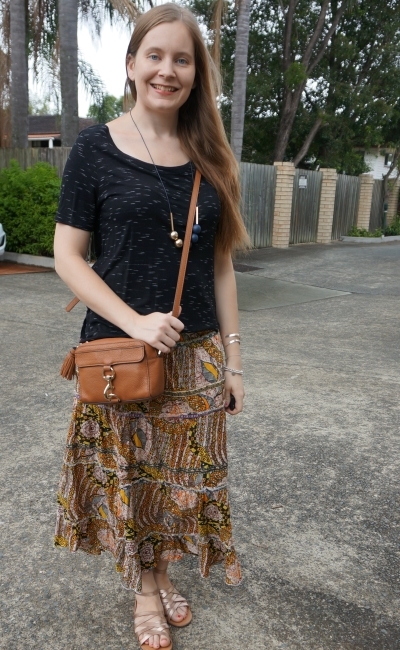 If you're looking for a another way to wear a tee in summer instead of shorts, why not try a maxi skirt? You can pick a basic block colour skirt like the chambray one, or change it up a little with a printed skirt like in the first outfit. It's an easy combination to pull together that's still just as practical to wear in the heat if you pick a lighter fabric maxi skirt. Linking up with Fabulous Friday, Fancy Friday.